While Florida students were marching in support of gun regulation, U.S. Supreme Court Associate Justice Clarence Thomas issued a scathing dissent in support of the Second Amendment. 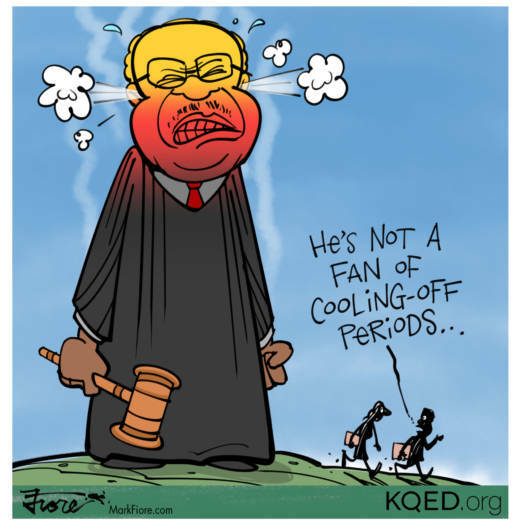 On Tuesday, the Supreme Court declined to hear a case about a California law that imposes a 10-day cooling-off period for firearm purchases. After harshly criticizing his fellow Supreme Court jurists, Thomas went on to say that in the 9th U.S. Circuit Court of Appeals, "rights that have no basis in the Constitution receive greater protection than the Second Amendment." Having survived this latest legal challenge, California's 10-day waiting period to buy a gun will remain in effect, leaving the state with the strictest gun laws in the nation. Meanwhile, L.A. law enforcement officials arrested a 17-year-old high school student after a school security officer overheard the student threatening to commit a shooting. Two AR-15 assault rifles, 90 high-capacity magazines and other handguns were found in the home the student shared with his older brother, who was also arrested.